Who wouldn’t take Bear Grylls’ name as a guarantee of quality when it comes to knives? It is valid for sharpeners as well. If you are the survivalist or the outdoors type, this sharpener is a match to your knives. This gadget was conceived for outdoor workers, campers and so on. 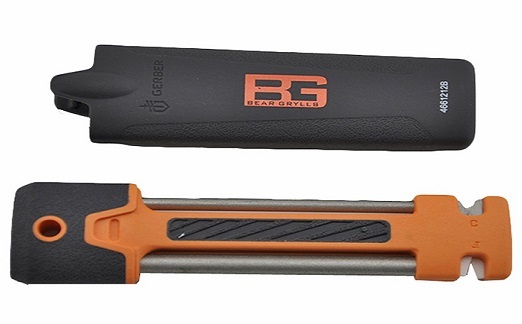 The Bear Grylls Field Sharpener from Gerber is encased in a hard plastic cover that feels smooth and comfortable. Also, it fits well inside the pockets. The handle is made of a type of rubber that’s easy to grip under any circumstances. This feature was very helpful in cold, hot or humid conditions. Furthermore, it has two rods with diamond coating and ceramic inserts, to suit several types of blades. The two rod-shaped sharpeners coated in diamond are made specifically for serrations. Most survival knives have a serrated section. The rods can handle all such sections on the blades. For a good finishing and a finer edge, you have the carbide and ceramic inserts. The diamond rods are in a fixed position, but the ceramic and carbide parts can be adjusted. This Gerber sharpener is a simple tool, yet its features make it versatile and useful in a lot of situations. Because of its distinct sharpening pieces, it can do several jobs, from quick rough sharpening to making a smooth finish. The pressure you apply also plays a role in this. Out in the field, there are so many tasks and cutting jobs. Blades get damaged in so many ways, so frequently. The Gerber tool addresses this issues exactly. The Bear Grylls Field Sharpener is a niche product and not many have tried it so far. It is a gadget that largely remains unknown. Customer ratings give it 3.8/5 stars. Because it does not come with enough instructions, many users have to learn by themselves and find the right technique. Soon, this problem is gone. I still recommend it to novice users. While in the field, you will need to do a touch up and give that knife a better edge. Having this small tool and its varied insertions has helped many. But don’t expect much from a $14 tool. Gerber is already a big name as a knives manufacturer. With this compact survival knife sharpener, the company has met the needs of busy outdoors people who have no other means to restore a blade’s condition. Note that it was not made to handle extended sharpening jobs. It is not meant to solve all the problems of the knives you use. It is, though, made to help people out in the wild when the edge of their survival knife has worn out. Overall, you will enjoy a very solid tool with an excellent grip – this aspect being one that truly matters here.